Indian Institute of Technology Bhubaneswar is celebrating its 10th Foundation Day on 12th February 2018 at Arugul Campus, Jatni, Bhubaneswar. On this occasions, we are planning a one-day Open Day at our campus on Monday, 12th February 2018 from 11:30 AM to 5: 00 PM. The event is intended to excite and inspire young school children towards the areas of Science and Technology. 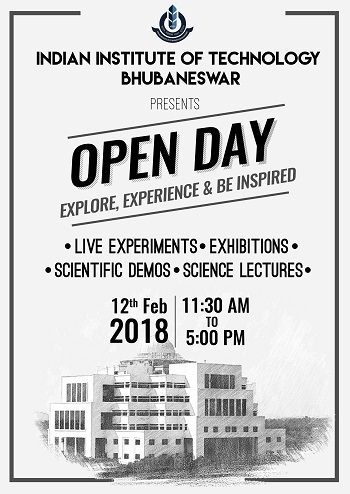 Open Day is an opportunity for school students to gain perspective about science and technology from the experience of faculty, research scholars and students of IIT Bhubaneswar. The Open Day is organized to showcase research in the institute and to communicate important concepts in science and engineering to the school students. On this day, high school children from 8th grade to 12th Grade will have an opportunity to visit the Institute and go around the campus to explore, experience and enjoy the activities of the Institute. The activities will include demonstrations and exhibitions that will be held in various Schools of IIT Bhubaneswar.